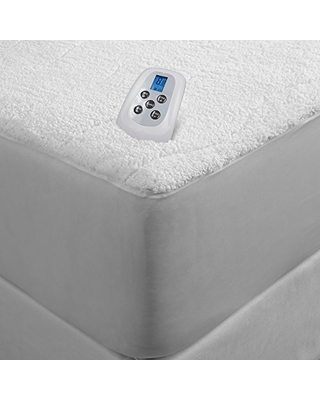 After having tried several heated mattress pads here are my thoughts on the pros and cons of several types of features that you can shop for. Many reviews focus on if you can feel the wires or not in the mattress pad. The traditional mattress pads run 120 volts moderate sized wires which you can generally feel unless you buy one with allot of padding. While you can feel the wires you quickly forget that they are there. A second type of mattress pad uses very thin wires and low voltage around 20 – 30 volts. With this type of mattress you can literally not feel the wires on your back when you are lying down. Be sure the check the overall wattage, however because this type may not consume as much total power making it heat up slightly slower or not each as high of a temperature. The control box on heated mattress pads ranges from a simple dial to a digital remote control. In my experience selecting a heat level from a digital control takes a lot longer than just twisting a dial. Another consideration is that one mattress pad one the market has a built in shutoff timer that you can adjust. This is a nice feature if you heat up the bed just before you fall asleep and don’t use it throughout the night.